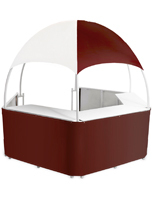 This burgundy/white gazebo is grand-sized display tent with plenty of counter and storage space. 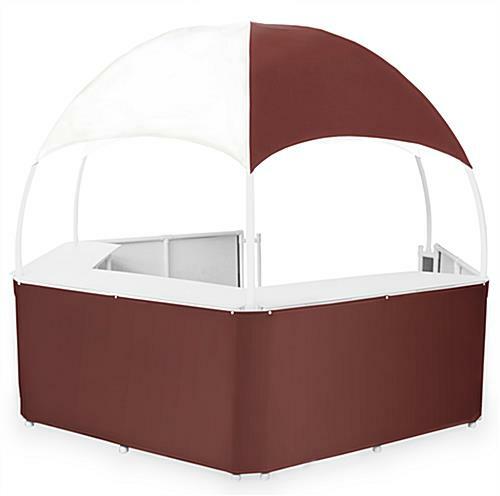 Its wine-colored vinyl canopy top and skirt make it a perfect fit for a classy, outdoor wedding or fundraiser. 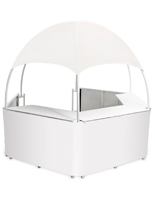 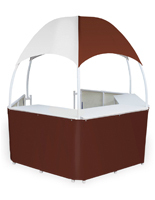 At 12’ wide, 4 to 5 people can work inside this large gazebo kiosk without feeling cramped. With a wraparound design, your staff can interact with multiple customers at once. 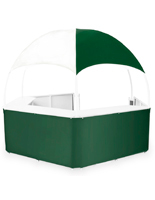 Due to its FDA-approved countertops, this display tent is often used by food service and catering companies. 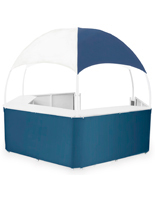 Its portable design allows this canopy to be used for a variety of functions, ranging from trade shows to information stations to registration booths - both indoor and outdoor. Whether you’re exhibiting at a trade show or serving drinks at a wedding, this gazebo kiosk offers flexibility and durability for business on the go. 63.0" x 38.0" x 19.0"